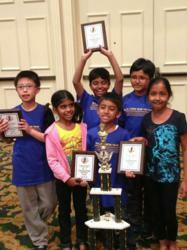 It’s the Most Wonderful time of the year for young chess players in Fremont, California. FremontChess.com has announced their winter schedule and it’s chock full of rated tournaments, holiday chess camps and fun chess classes that are sure to inspire all who attend. The winter program kicks off on December 15th with the FremontChess.com Chess Quads. This round robin tournament is a great choice for young chess players because the format is non-elimination and all the participants are broken into groups of four (a quad) to ensure players of the same skill level are paired against each other. For only $25 ($20/quad if you sign up for 3), children will play three rated games, receive 1-on-1 instruction with professional coaches and be awarded a prize at the end of the tournament. The FremontChess.com Winter Chess Camp is a special chess program designed and taught by nationally renowned chess instructor Chris Torres. Due to the popularity of this camp, this year Chris Torres will be offering two unique three day chess camps each with a full day’s focus on opening, middle game and endgames. The FremontChess.com Winter Chess Camp will meet December 26-28th from 12:00 pm until 4:00 pm and then again January 2-4th from 12:00 pm until 4:00 pm. Both camps will have their own unique lessons and tournaments so students can attend both programs without any repeating material. The tuition for each camp is $150 and a child can both session for $250. All children who attend at least three days will receive an award and a certificate on their final day of camp. The longest running Saturday chess class in Fremont reconvenes on January 5th. The FremontChess.com Chess Team is a very special chess program designed and taught by twenty-year professional chess coach Chris Torres. This class will provide experienced tournament players with instruction that will quickly increase their ability and understanding of chess. Participants will begin their afternoon by participating in an hour long chess class taught by Chris Torres. Students will then play 1 USCF rated chess game as part of the ongoing tournament and receive analysis of their play. The FremontChess.com Chess Team will meet every Saturday from 11:00 am until 1:00 pm and tuition for this class is only $180 for 10 classes. Signing up for all of these events is easy at www.FremontChess.com. While you’re there, be sure to take advantage of the 100’s of free lessons and chess puzzles on FremontChess.com this Holiday Season. Finally, check out our online chess store for special deals on the perfect chess stocking stuffers.